M.I Industries is the preferred name in the market that offers Telescope Key Chain that can be availed in numerous specifications, to fulfill the diverse client requirements. Known for their supreme finishing, elegant designs, these key chains are popular in the industry. We provide the proposed range of telescopic key chains at industry leading prices. 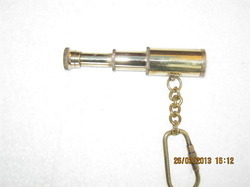 This is beautiful telescope key chain with awesome quality product telescope key chain. It is a best gift for collectors. This is beautiful 3 fold pipe key chain telescope. The telescope is 1.5 inch long in folded position and 5 inch long in expanded position with a hanging ring for holding keys. 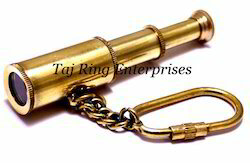 This handcrafted antique Telescope keychain is a real and usable keychain made of pure brass. The telescope is 1.5 inch long in folded position and 5 inch long in expanded position with a hanging ring for holding keys.